I have had some great fun playing around with some Vegan baking over the last few weeks. Something I was a little skeptical about to start with if I am honest, more from my lack of understanding around Vegan baking. But I tried a few great recipes from the Little Blog of Vegan who I follow on Instagram, which have been delicious, especially the carrot cake and this got me intrigued. I think the key is to make things that can stand in their own right and where the non vegan equivalent is not so dairy and egg laden that you struggle to get the same textures and flavours. 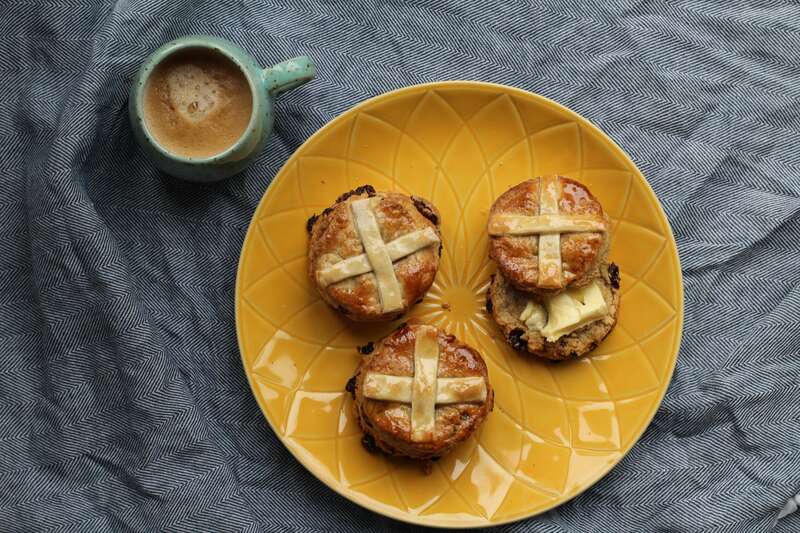 So it was perfect timing when I was prepping for an Easter baking class that I was presenting with Bake with a Legend that I was asked if I could make the hot cross scones vegan. It was such a simple switch. I swapped out the butter for dairy free spread and the buttermilk for almond milk with a squeeze of lemon to give it the acidity needed to help the rise. They came out tasting delicious, warmly spiced, full of fruit and with exactly that same texture. I have come to realize how inclusive Vegan baking can be. I am tempted to build out a class just around Vegan baking now. Preheat the oven to 220°C/ Fan 200°C/ Gas 7. Sift the self-raising flour into a large bowl and rub in the dairy free spread with your fingertips. Stir in the sugar, fruits and spice. In a jug, mix together the dairy free milk and lemon juice. Pour into the flour mixture and bring together to make a soft dough with your hands. Don’t worry if it seems sticky and a little wet. Dust a work surface with extra flour, then roll out the dough to no thinner than 2cm. Using a 4cm cutter, cut out the scones– try not to twist the cutter, as this makes the scones rise unevenly. Re-roll the off cuts and cut out more. You should get between 8-10 scones. Place on a baking sheet lined with parchment. Mix together the plain flour and 1-2 tablespoons of water and knead to make a smooth dough. 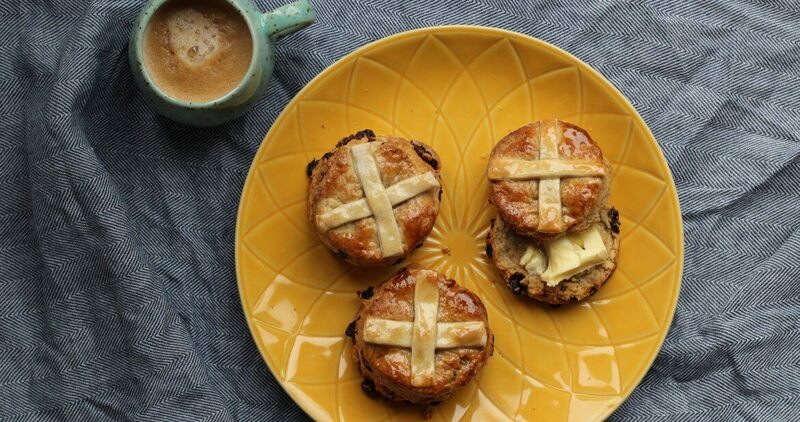 Roll out, cut into thin strips and put a cross on top of each scone. Brush with non dairy milk, then bake for 15 minutes, until well risen and golden. Dissolve the sugar in 2 tablespoons boiling water. Use to brush the tops of the scones as soon as they come out of the oven. Cool slightly on a wire rack. Best eaten while warm but once cooled can be kept in an airtight tin for a few days. 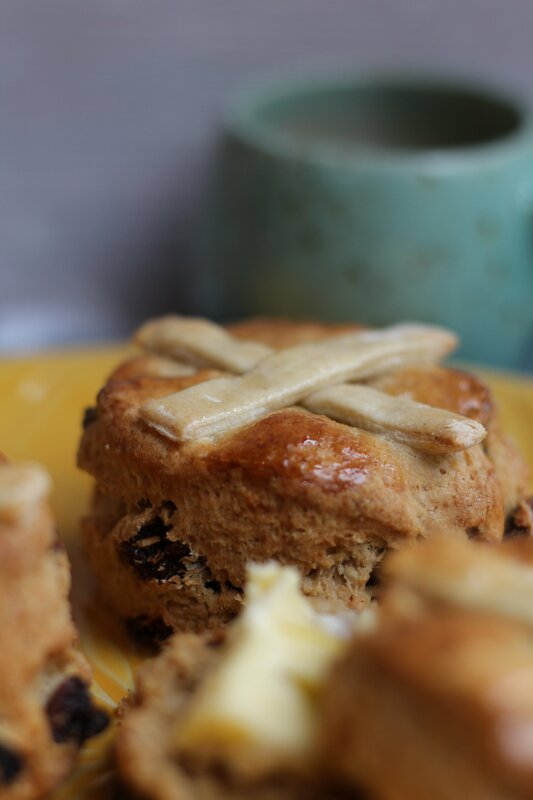 The ultimate Vegan / Dairy free "Hot Cross Scone" . A lovely warmly spiced , light scone , packed full of fruit and delicious eaten warm out of the oven . A great inclusive Easter bake that everyone can enjoy. In a jug, mix together the dairy free milk and lemon juice. Pour into the flour mixture and bring together to make a soft dough with your hands. Don't worry if it seems sticky and a little wet.